TRIAL EVENT ELECTION RESULTS: Battleline again garnered the most support in BPA's annual Second Chance election for events lacking sufficient players, player-hours, or both to qualify for the Century. The Annual Survey of the membership admitted two new events (Dominion and Stone Age) while welcoming back 22 returning favorites in the New and Continuing Trials category. Also rejoining the menu for 2009 was a surprising veteran from yesteryear as Tyranno Ex made its return after a three-year absence. The seemingly annual exception to the rule that once its gone, its forgotten seems to be gaining ground. 22 events from 2008 failed to make the cut including such long standing favorites as ASL, Republic of Rome and Tikal. Some of those events falling short may yet return via Vendor/Sponsor support, or the failure of qualifying events to generate the necessary GM commitment by Feb. 28. View the current WBC 2009 lineup on the Orphans Page which will be updated weekly between now and March when GM submissions end. Check out complete vote totals at http://www.boardgamers.org/wbc/trialvote.htm . ENGELMANN WINS SPORTSMANSHIP FOR SECOND TIME: There are those who liken the Sportsmanship vote which is held during our Annual Membership Drive to a popularity contest. If that's so, there's no doubt remaining who is WBC's Belle of the Ball after this year's vote. Coming on the heels of her overwhelming victory in the latest Board elections, the BPA webmaster has proven herself to be one popular lady at WBC. Kaarin Englemann won handily in what was basically a two-horse race between herself and Sean McCulloch. Kaarin, nominated for accepting outrageous fortune with aplomb in the Here I Stand semis, took 21% of the 280 votes caste to become the first two-time winner of the award. Runner-up Sean McCulloch garnered 19% of the vote for stepping in to GM a Junior's event for a no-show. Rounding out the top six finalists were Tom Dunning, Barry Shutt, Craig Moffit and Jonathan Lockwood. For more details, see http://www.boardgamers.org/wbc/sportsman.htm. GM RESERVATIONS: All WBC GMs are reminded that their event	"reservations" for the events they ran in 2008 expired on Jan. 1. To retain GM status of an event, you must submit a new event form at http://www.boardgamers.org/forms/EventForm.htm and renew your membership before Feb 28th. Please check the Orphans List to confirm that requested times are current. All qualifying events currently without GM commitments are now listed as OPEN on the Orphan's List at http://www.boardgamers.org/wbc/orphans.htm. Events without GM commitments will be replaced by events from the Alternate list on Feb. 28. If you want to be considered for such a vacancy or recommended to a sponsor, submit an event form and be a current member by Feb. 28. Vendors/Sponsors are likewise reminded to submit or authorize their 2009 Trial Events by Feb. 28. We also are in need of a few Juniors events and Seminar speakers. Contact acd@boardgamers.org with any suggestions for same. Board. When contemplating nominations, members are urged to consider that the BPA conducts most of its business by email and needs Board members who are able and willing to offer their time and skills to the organization in a timely manner. Board members should be considered more for their ability to contribute to the running of a successful company than for their attachment to any particular game or genre. Besides forwarding a signed nomination for himself/herself, each nominee should submit by March 1 a statement not to exceed 100 words summarizing what they can contribute in service to the Board of Directors of the BPA. The nomination form is on line at http://www.boardgamers.org/bpanom.htm. 2008 PATRONS: The BPA's list of 2008 Patrons is now posted at http://www.boardgamers.org/wbc/patrons.htm. Please report any inaccuracies to doncon99@toad.net no later than Jan. 31 to ensure an accurate listing in the upcoming Yearbook. 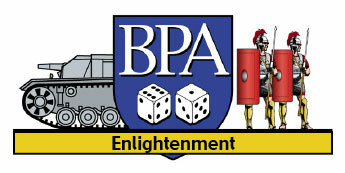 ENLIGHTENMENT XII: The 12th annual meeting of BPA's Age of Renaissance mini-con is March 20-22 at the newly renovated Day's Hotel in Timonium, MD. Coming off its best attendance in recent years wherein it actually outdrew the tournament at WBC, Enlightenment will retain its new dual event format in its effort to draw a minimum of 25 players or host its farewell performance in 2009. Manifest Destiny will join the program as two four-round events are held in three full days of gaming. Only one of the eight rounds will conflict on Sunday morning - giving players a choice as to which event they want to play the extra round. Note that it will be possible, but more difficult, to win both events since each tournament allows players to drop one of four scores. BPA has obtained a very favorable group room rate of $89 per night plus taxes. To obtain this rate you must identify your affiliation with the BPA's Enlightenment gaming conference and make your reservation before March 1, 2009 (or when our roomblock sells out, whichever occurs first) at 1-800-235-3297 or 410-560-1000 weekdays between 8 AM and 7 PM Eastern Time. For full details, see http://www.boardgamers.org/specific/aor09ann.htm. VICTORY IN THE PACIFIC PBeM: The third and fourth rounds continued the bloodbath among the top seeds which began in the second round. Almost half the games went to the bottom seed in the third round while a majority did so in the third round. Of the original 42 players, only three remain - the 7th, 15th, and 23rd seeds. Ed Paule (the 23rd seed) has four upsets to his name already - having played from the bottom half in every round. He’s also the only one who could win the tournament without having received a bye at some point. He’s up against Larry Meyers (7th seed) in the semi-final. In the just-completed rounds, the IJN are doing even better than their historical average (58%) - with 63% of the wins. It helps that our upset champion is 4-0 as the IJN. Larry is 3-0 as the IJN with one round as a bye. Joe Dragan (15th seed) is taking a bye this round; he’s 3-0 as the IJN and 1-0 as the USN. Will the fact that Joe’s the only one left who’s won as the USN work in his favor? How high will Larry and Ed go in the bidding to stick with their favorite side? Keep an eye on http://www.gameaholics.com/vitp_bpa/vitp_bpa_single_elim_07.htm to find out! Last updated 1/26/09 by kae.